Enhance early season vigor. Drive maximum root growth in row crops. Reduce stress. Maximize yield potential. Support increased profits. Give back to your roots. Give back to your local FFA. 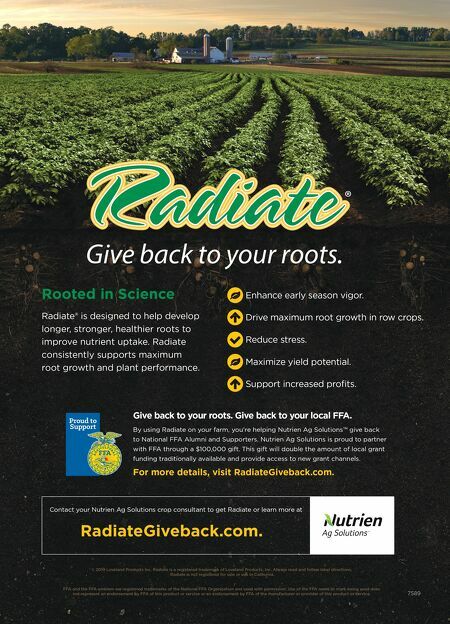 By using Radiate on your farm, you're helping Nutrien Ag Solutions™ give back to National FFA Alumni and Supporters. Nutrien Ag Solutions is proud to partner with FFA through a $100,000 gift. This gift will double the amount of local grant funding traditionally available and provide access to new grant channels. For more details, visit RadiateGiveback.com. Contact your Nutrien Ag Solutions crop consultant to get Radiate or learn more at © 2019 Loveland Products Inc. Radiate is a registered trademark of Loveland Products, Inc. Always read and follow label directions. Radiate is not registered for sale or use in California. FFA and the FFA emblem are registered trademarks of the National FFA Organization and used with permission. Use of the FFA name or mark being used does not represent an endorsement by FFA of this product or service or an endorsement by FFA of the manufacturer or provider of this product or service. 7589 RadiateGiveback.com. Rooted in Science Radiate® is designed to help develop longer, stronger, healthier roots to improve nutrient uptake. Radiate consistently supports maximum root growth and plant performance.